ATTACK OF THE KILLER ZOMBIFYING MUSHROOMS!!?! 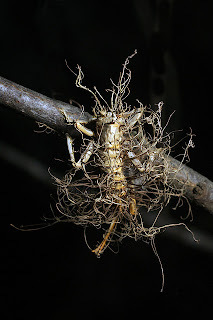 Cordyceps, alias Ophiocordyceps. A mindless, heartless fungus dedicated solely to the survival of itself and her spawn. Tiny, unassuming specks travel in the wind. Without thought, without intention, without virtue. They land wherever they might. Millions will die a cold, lonely, senseless death. A few... a chosen few will live. 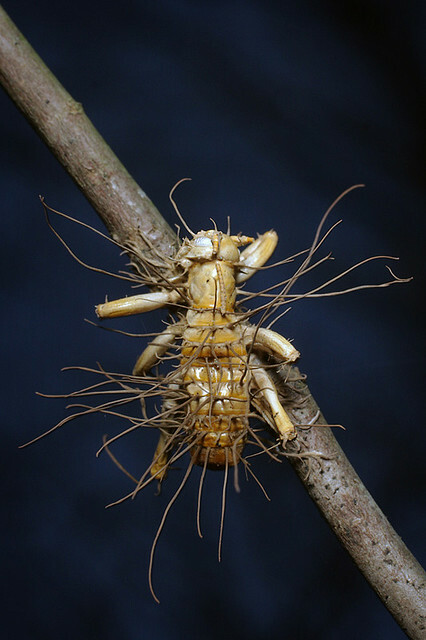 An insect or arachnid, quietly goes about its business. Pollinating the flowers that bring such beauty to our world, controlling the pests that would wreak such destruction or gathering the food that feeds the next generation and serves queen and colony. The fungus doesn't care. The fungus doesn't feel. 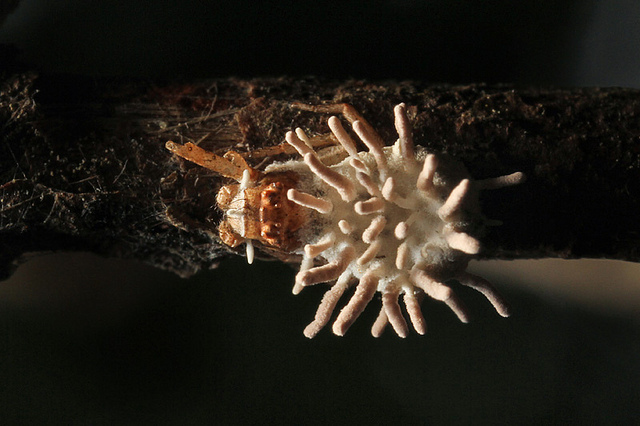 The fungus merely latches on to its prey. Soon, it enters the internal cavity of its host. Mycelia spread like roots through the victim's body, turning innards into sugars... food for further growth. It's the ants I pray for. She is no longer one of our own. Cast out from her family, the afflicted continues her descent into madness as the fungus consumes her, infects her mind and gains control. 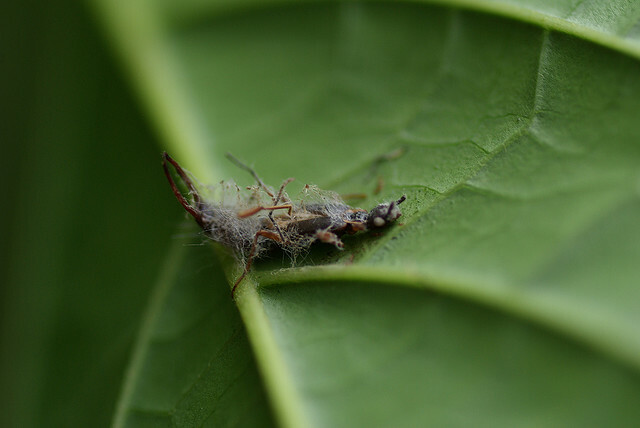 Her - the ant's - final act, if indeed it can any longer be called her own, is to climb up a plant stem and bite down on it. This will happen at noon and she may be joined by numerous kin, all laid low by the same plague. Here she will stay, the fungus continuing to consume her from the inside but leaving be the muscles of her mandibles. Her mandibles, once her strength, her power are now her undoing. 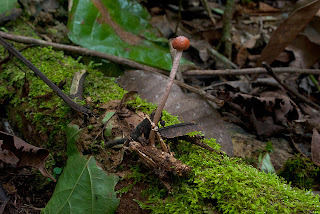 For this place, above the forest floor and below the humidity of the canopy, is where the fungus wishes to be. Come sunset, the fungus will finally reveal itself. 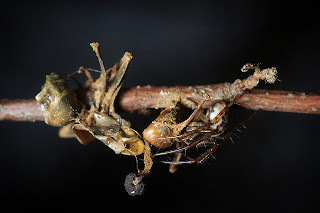 A stalk erupts from the ant's head and grows through the cool of night, using the energy gained from her victim's once vital form. Weeks pass before the true horror is unveiled. The stalk grows, expands and lengthens. Shape and colour are corrupted like the work of a deranged artist as what is known as the fruiting body, ripens. It is an evil fruit indeed, the seeds of which are the spores, the tiny, unassuming specks, cast off into the wind - ready to strike again. There are hundreds of species of Cordyceps across the world, probably many more as yet undiscovered or blanketed beneath a single name. okay, of all the posts you've done that i've read, this one is by far the scariest, creepiest, ickiest, grossest, horrific, yucky, (i've run out of adjectives...) eek! I'm glad you think so! I thought the subject matter warranted an absurd degree of over-the-top scary talk. A good close up picture of this stuff is utterly horrendous in itself. I remember seeing that video and being utterly shocked! Excellent post. I was compelled to read every word. Then I had to read the whole thing again. Do they ever attack anything larger than insects? I've heard of similar parasitic mind-control species but nothing we need to worry about Emma. Or at least that's what the Reptoids want you to believe! @Emma: Thank you very much! I don't think these fungi go for anything else but there are quite a few worms and various parasites that can do this sort of thing. 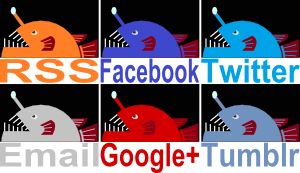 There are ones that infect snails, others shrimp, frogs, rats and others. They make their host overly confident or attracted to light so that a bird or cat can eat them and then the parasite is in its next host. From the bird it lays its eggs. I quite recently heard that there is also research into whether organism like that could be part of the cause of mental illnesses and overly aggressive behaviour in humans, so who knows? @Crunchy: Those dastardly Reptoids! Why can't they just go out kissing babies and saying everyone is "hard-working" like everyone else? Sooooo this is acctually a real thing!!!!???? haha glad i stumbled upon your blog! Oh yes, it's real alright! Whether it SHOULD be is another question entirely! Thanks for popping in, Leontien! Yes! It's quite strange that. At least you're on the right side of that food chain! Horror movie writers don't have any original ideas. No matter what freaky alien monster they imagine, nature's done it first. And nature's done it BETTER. I completely agree! I find it quite amazing how much of our imagination is one long catch-up. I'd heard of this game but I had no idea it had Cordyceps type stuff in it. That's great! Yes, as Henderson said, this currently is in The Last of US game except it affects humans. In the sci-phi videogame created by Naughty Dog, humans affected with this fungus show signs of extreme aggression, with different phases of it. Some may call them "zombies". 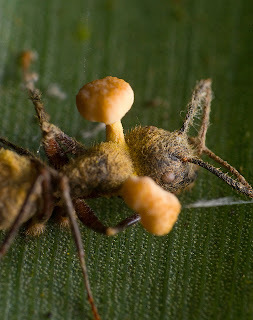 The longer you have been "Infected" with the Cordyceps, the more fungus you have all over your face. I never knew that stuff actually EXISTED! Terrifying stuff! The world is certainly full to the brim with inspiration for horror and sundry nastiness! What if it was able to infect to humans in the reality? The whole world would be a horror movie!